My, my, it's been awhile! It's taking far more effort than expected to dust off my blogging skills, which are meager to begin with. 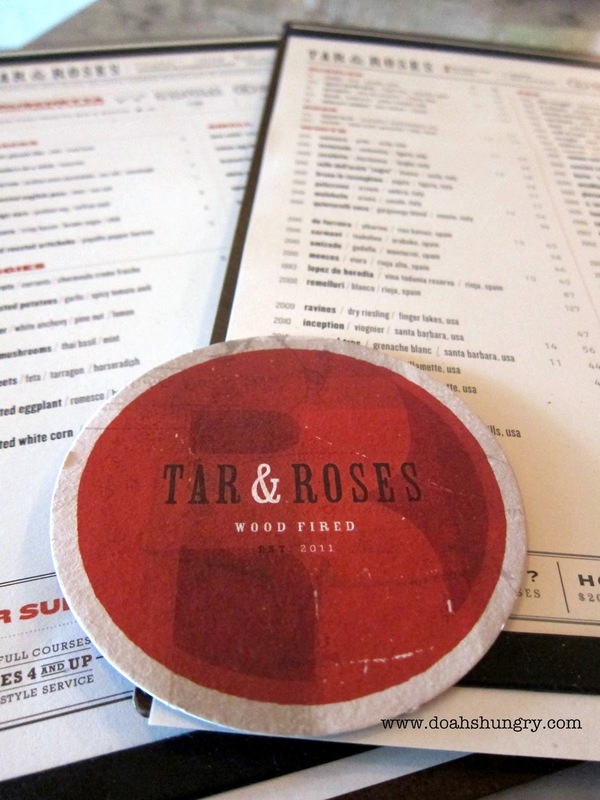 Nonetheless, I'm back and ready to report on one of Santa Monica's relatively new and delightful restaurant, Tar & Roses. This corner restaurant, located on Santa Monica Blvd. & 6th, is home to Chef Andrew Kirshner and a favorite dinner spot for many others. I suspect they will become a happening place to lunch too, once they open during the day. Two of my closest friends and I dined at Tar & Roses in celebration of my finishing law school back in May. I haven't re-visited the restaurant yet, but that first meal was noteworthy enough to leave stick in my memory. That's pretty impressive, considering what I was consuming -- and more significantly, what was consuming me -- this summer. (I also really need to start making a habit of writing down my food thoughts in a Moleskine). Tar & Roses is known for describing the aromas of Italy's famous Barolo wine. 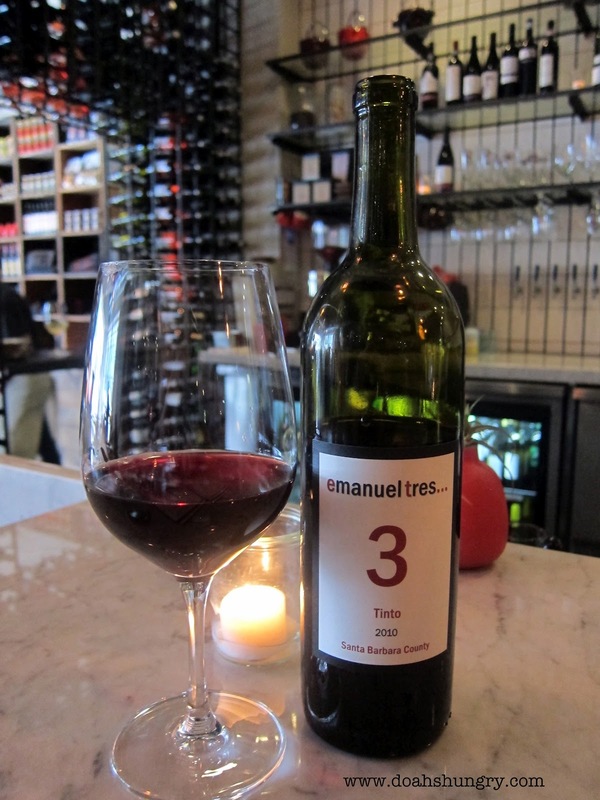 While I didn't sample T&R's Italian wine, which constitutes a lengthy list, the Emanuel Tres from the Tempranillo vines of Santa Barbara County did a splendid job of starting off the night down the right path. One of the beauty's of T&R's menu is it offers snacks, small plates, and large plates, all of which can easily be shared. So that's what we did. For our meats, we chose Prosciutto Americano and Finnochiona, a Tuscan salami made with fennel. For our cheese, we opted for a slice of Idiazabal, a hard cheese made of sheep milk. The nutty, buttery flavor of the cheese paired well with the quince marmalade and various nuts. The highlight was the kitchen's special for the evening: Fried Pig Tails. The honeyed crispiness of the batter and the cilantro made for a delicious combo. As imagined, there isn't that much meat found on a pig tail, but what was there was devoured. The lamb belly was adorned with mint and apple chutney. The melting fattiness, fleshiness, and sweetness of it all was more satisfying with each new bite. The duck was cooked to perfection, retaining every rich flavor a duck dish should have. The plum chutney was a nice touch, but not necessary. I found the ice cream tastier than the strawberry crostata, but of course that did not stop me from eating both until I reached glutton's door. In sum, T & R is a place you need to check out! The meal can end up being a bit pricey, but keep in mind, a lot of plates can be shared. Enjoy.